Description: Rapidly creating and using a Virtual Operations Room for immersive training and for real missions. Outreach to geographically dispersed teams and agencies for input of their analysis skills. Robust and survivable alternatives to physical Operations Rooms. Demonstration shows examples of shared information access via the web (video feeds, weather screens, Twitter feed on nominated search tags), and team and personal task support (e.g. teamwork support, intelligent planing and workflow aids, and meeting support delivered from a collaboration portal web site). Benefit of Virtual World Chosen: Second Life is an openly accessible virtual world with many elements suited to collaboration. It can be used freely with instant registration and access for new users and can provide publicly accessible areas for work across institutions. Opensim is open source and is compatible with the Second Life viewer. 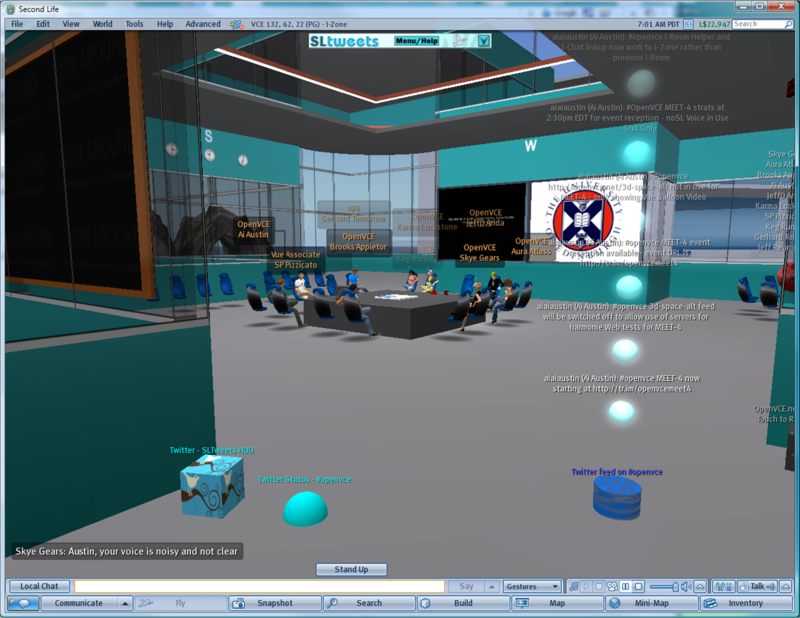 It is not as scalable a platform at this stage as Second Life, but it offers richer collaborative and media facilities, as well as the capability to be self hosted to run behind firewalls. This entry was posted in Second Life and tagged FVWC, I-Room, I-Zone, Second Life. Bookmark the permalink.